Ali Sami Yen Spor Kompleksi A.K.A Türk Telekom Arena is the new stadium of famous Turkish football team, Galatasaray S.K. 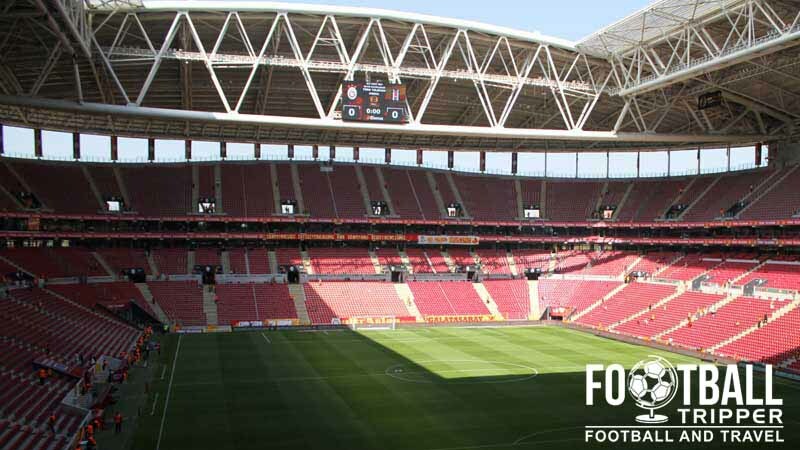 Opened in 2011, with a capacity of 52,650 the ground cost a reported $250 million and holds the distinction of being the only suitable Turkish stadium for hosting matches of the UEFA Euro 2020 Championships. Galatasaray’s Türk Telekom Arena was built over a four year period between 2007 – 2011 in order to replace the ageing Ali Sami Yen Stadium which was named in tribute to the club’s founder. Plans to build a brand new stadium in Istanbul date as far back as 1997 when Gala employed a Canadian architectural firm to design a state-of-the-art ground but troubling economic times in 2001 and again in 2008 put the brakes on the project as the Turkish club couldn’t raise the necessary capital. As a short term solution parts of Ali Sami Ye were renovated during the 2004-2005 season with the old Open Tribune demolished and rebuilt a season after due to safety concerns. Recognizing the need for a more sustainable course of action, Galatasaray negotiated with the local council to hand over the property and land of the former stadium in exchange for a new plot of land in Aslantepe complete with permission to build the new stadium. With Gala now securing the required finances the project was given the greenlight and the 52,652 all-seater stadium and ground was broke on the 13th December 2007. 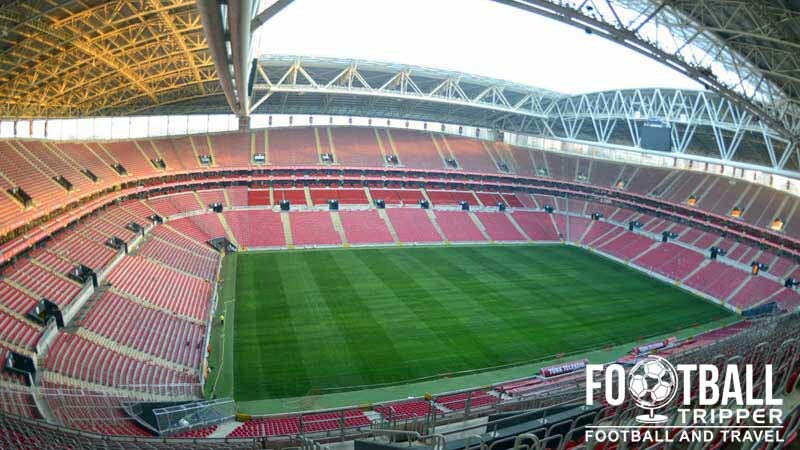 Said to be by Schalke’s Veltins Arena, the ground was constructed under the working title of Aslantepe which means Lion Hill after the symbol of Galatasaray, with the naming rights eventually sold to Türk Telekom on a 10 year deal worth over $100 million during the 2010/2011 season. The Ali Sami Yen Stadium had earned the nickname of “Hell” amongst football fans, and the new Türk Telekom Arena certainly maintains its predecessors fierce reputation. In 2011 Galatasaray’s ground recorded a noise level of 131.76 decibels which was a Guinness World record for “loudest crowd roar at a sport stadium” until this record was beaten two years later at Century Link Field for an NFL game. The record attendance to date was 52,044 against Real Madrid during a 2013 Champions League match. 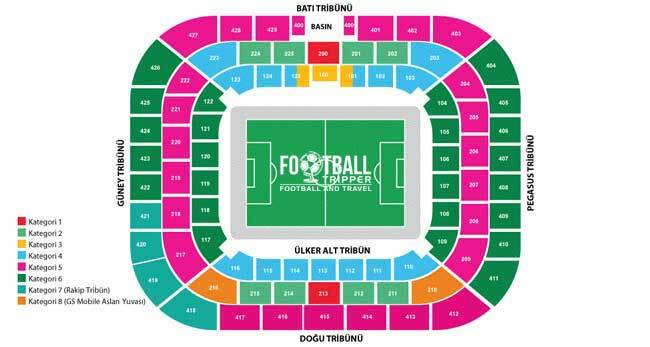 The Türk Telekom Arena is comprised of four stands: North, East, South and West. Away fans are housed within the top-tier of the south-east corner within sections 418, 419, 420 and 421. The away allocation for Arsenal’s Champions League match back in December 2014 was 2,456. Access is available via gates G11 and G12 at the back of the east stand. There’s not really anywhere to drink once you get to the stadium with many fans choosing to stay in the Beyoglu area and its bars before getting on the metro. Galatasaray’s club shop at the stadium spans over 1,650m² across two floors, and with the exception of the online GS Store, is the definitive place to purchase official merchandise of the Cim-Bom. Matchdays: At least a few hours before kick-off. The Galatasaray Stadium Shop. The exterior is said to be a mini-replica of the larger Turk Telekom Arena! 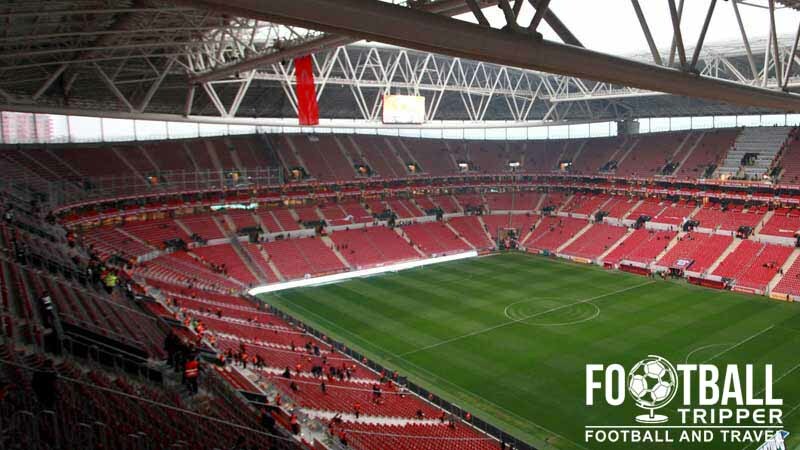 Much to the disappointment of football fans worldwide it doesn’t appear as if Galatasaray currently offer fans the chance to undertake a stadium tour of the new facilities in Istanbul. If this changes in the future we will be sure to update this section. Tickets to see Galatasary are usually quite hard to obtain due to the popularity of the club. With over 40,000 season ticket holders this leaves around 12,000 tickets theoretically for sale, but by the time they become available on general sale there’s likely to be a thousand available at most. Galatasary lack their own online booking facility which means the tickets are often listed on reseller websites which can certainly murky the water when trying to find a reasonable price. 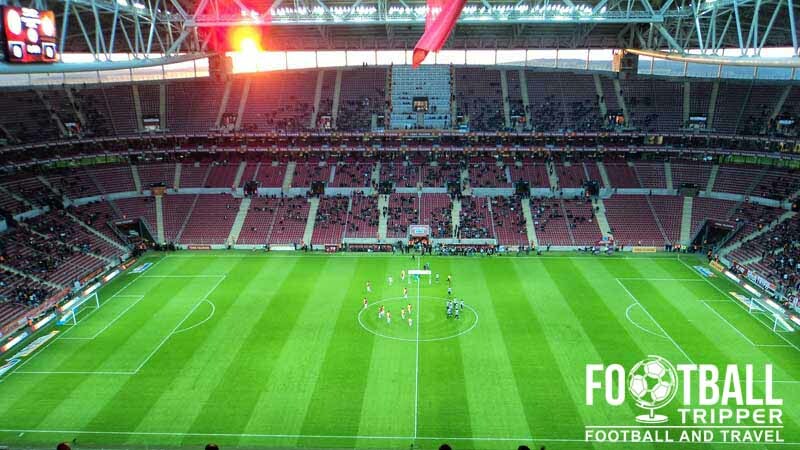 The fact that tickets are only listed online in the week leading up to the match certainly doesn’t help Football Tripper plan their visit to the Turk Telekom Arena. The ticket office usually opens around 2 and a half hours before kick-off and in the days leading up to the match. As tickets do sell out quickly you might have to utilise the service of ticket tours around the ground! Expect to pay no more than 100.00 TRY which is about 33.5 euros for an average seat. Türk Telekom Arena sits just over 12km north of Istanbul’s historic centre, close to the business districts of Levant and Maslak which are within the European side of the city. A fantastic view of Galatasaray’s stadium complex. The main railway station connecting Istanbul to the rest of Europe is Sirkeci which sits on the western side of the city. As its over 16km away it’s not very practical when travelling directly to Gala’s stadium however. Like other major European capitals, Istanbul’s metro system is arguably the easiest form of public transport to take when exploring the city. It is certainly the easiest way to travel to the Turk Telekom Arena with metro stop Seyrantepe the closest to the ground. Located on the Green Metro Line 2 it’s probably easiest if you get on at either at the start at Şişhane or the next stop along at Taksim. Be warned that on matchdays the metro can become very fully of fans making their way to the stadium, get there early! Situated out of town there are four large multi-story car-parks available for supporters to use which equate to around 3,225 spaces in total. Istanbul Atatürk Airport sits approximately 22km west of the city centre, and is the largest airport in Turkey with numerous international flight carriers flying in and out of Europe. There is also the smaller Sabiha Gökçen Airport which sits further away. Upon landing you can either catch the metro (light rail) into the city centre, or one of the express bus services known as “Havataş” which depart every half an hour between 4.00 am – 12.00 am daily. Located next to the large E-80 motorway hotels close to Galatasaray’s stadium are practically non-existent which means you’re better off looking back towards the start of the metro line. Three hotels worth looking at are Taksim Star, The Paradise Hoel and Chillout Cengo Hostel.